Making art takes a very specific kind of courage. Good art is individual and deeply personal; exposing the artist for who they really are. 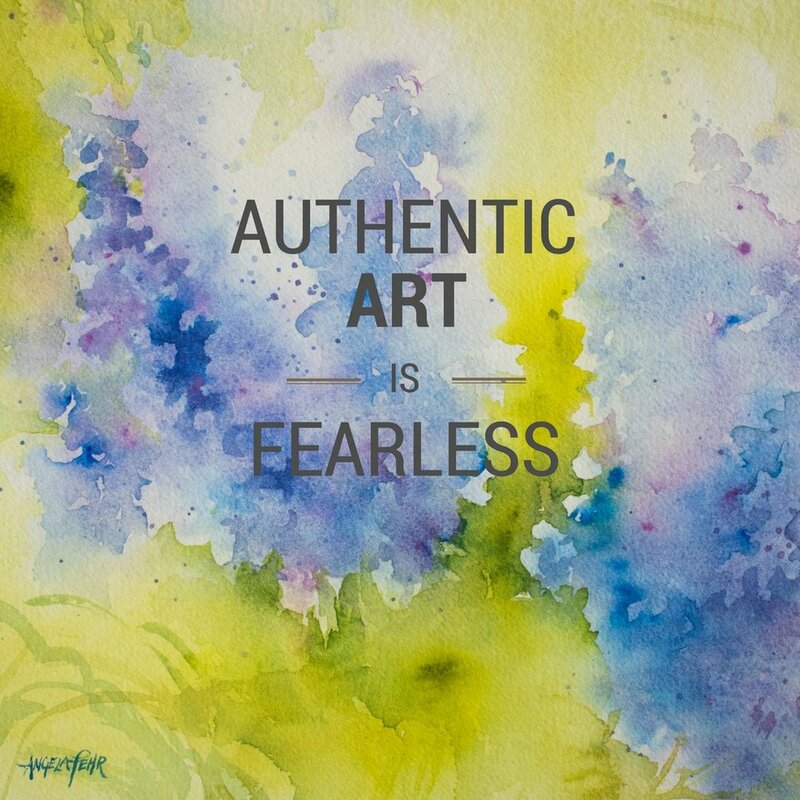 If you are not fearless, you cannot paint authentically, for inherent in authentic art is the vulnerability of putting your true self out there. Being fearless as an artist means taking risks. Making mistakes. Questioning what you think you know. Looking at a problem from both sides. Listening to advice, then making your own choices. Being a fearless artist means you look at others' art differently. Their choices are different from yours, but you see and respect what got them there. You are more patient with those who are still learning, because you know that there are many turns in the path, false starts and blind alleys, before you see where you are meant to be. 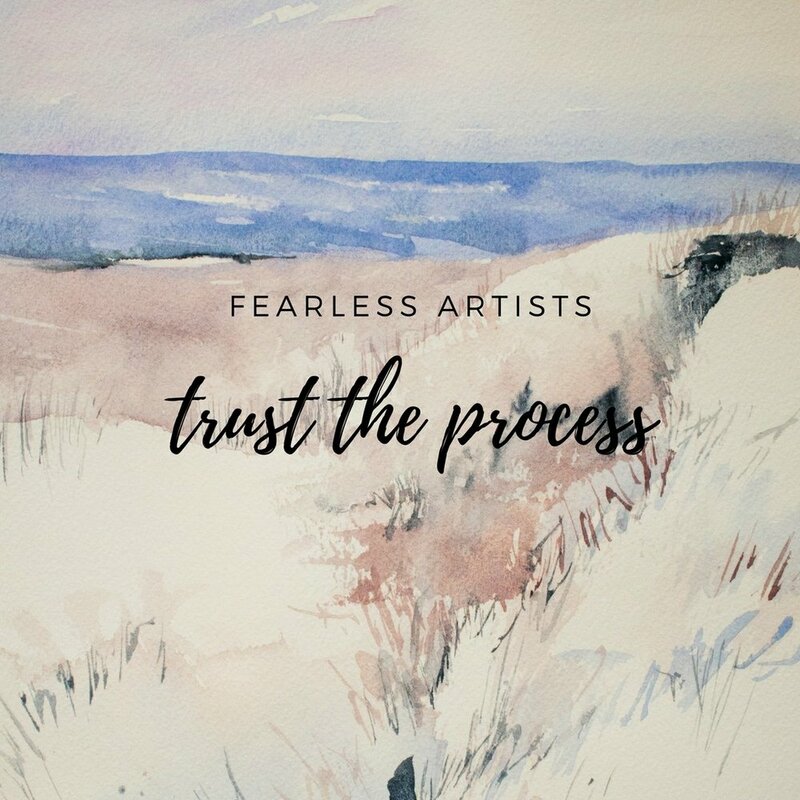 Being a fearless artist means you trust a little more. You didn't always see how things would turn out, but you have learned to be true to your path, even when it gets a little dark on the journey. Being a fearless artist means you understand that the face of fear is often hidden. How many times did you procrastinate out of fear, give in to negative self-talk, or perhaps even feel a little angry at the injustice of someone else's art being recognized, while you're still painting in solitude? You've learned to fight those emotions by exposing them to light, acknowledging that what felt so big was really just fear, and the risks that feel so scary are worth taking. Being a fearless artist means you lead by example. Many people are making art, but few are making fearless, authentic art. I knew I wanted to make more authentic art when I saw other artists making choices I didn't know I was allowed to make. I needed those role models to show me the way. It makes it even more of an honour when others find their authentic art journey through my example. Being a fearless artist means I know a secret to living a richer life. It's choosing to work toward solutions instead of seeing insurmountable problems. It's in forgiving mistakes and creating hope for the future. The three paintings shown above are part of my NEW, three painting course, "Sun, Snow, Flowers," available July 1-31, 2018 during World Watercolor Month. 10% of sales of this course will be donated to the Dreaming Zebra Foundation. Join me in celebrating World Watercolor Month with a series of weekly lessons in July, plus 5 giveaways! More info here.